Padauk, Walnut, Wenge, Aromatic cedar, Oak, Mahogany, maple. Another beautiful Cube.The pieces are the letters E L I Z A B E T H plus 4 more complex pieces. I dedicate this cube to a young friend who's name is Elizabeth.She is 2 and a half years old. It took me some time to design it but finally it has One solution.If you don't know where to start ,the cube could be surprisingly difficult, The puzzle is quite big ,You can see it in the more pics section. 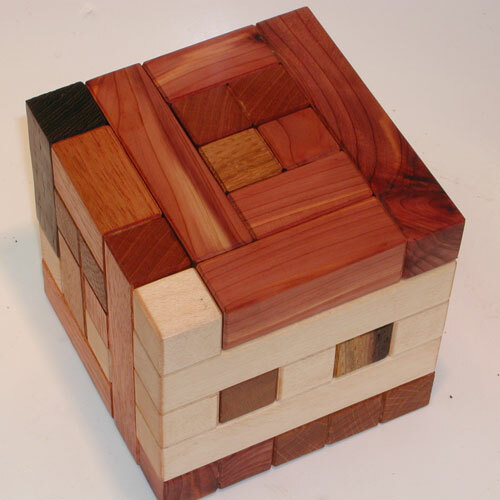 See more pics of the "cubeliza " puzzle.or Back to puzzle index.